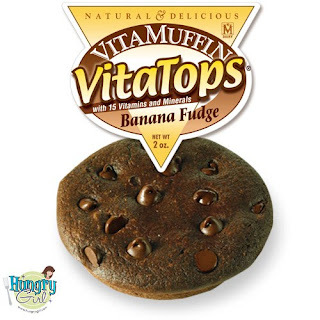 I've written about other VitaMuffin products in the past - their vitabrownies (not recommended) and their triple chocolate chunk vitatops (recommended). I haven't ordered any in awhile since they're really pricey and I haven't seen any good specials in ages. Last week they ran a free shipping offer with a Halloween pack where you could choose four chocolate flavors to make your own pack. I ordered on Monday morning, which their web site said would have the products arriving to my door on Thursday. They didn't even ship my package until Wednesday, and it came on Friday (which was nervewracking because we were heading out of town for a long weekend and I didn't want these to stay outside that whole time!). I chucked one of the banana fudge and one of the chocolate mint into my bag and took 'em with us on our trip. I tried the banana fudge a day later, at room temperature. I almost always eat vitatops from the freezer, popping them in the microwave for 30 seconds so they get warm and melty. Since this one was room temperature, it wasn't warm or melty, but it was still okay. I did not get much of a banana taste in this product, which was very disappointing. I am a huge fan of bananas and was really looking forward to this item! I've had their banana nut vitatops in the past, and they're tasty (would be even better without the nuts!). Overall, I guess I can't really recommend these? It's a hard call. I've now tried all four of the flavors I bought, and this one is just okay. I wouldn't throw them out, but I wouldn't order them again. There are better flavors.